There are many perennial herbs, meaning they can be planted once and left to grow for many years. Perennial herbs take some of the heavy lifting out of garden design by returning year after year. They are easy and always look wonderful. A perennial bed also allows you to divide and expand your herbal plants for free. When designing your garden, plant these herbs for a long-lasting herb garden. Not only is echinacea useful for healing, it is a beautiful accent for any garden. 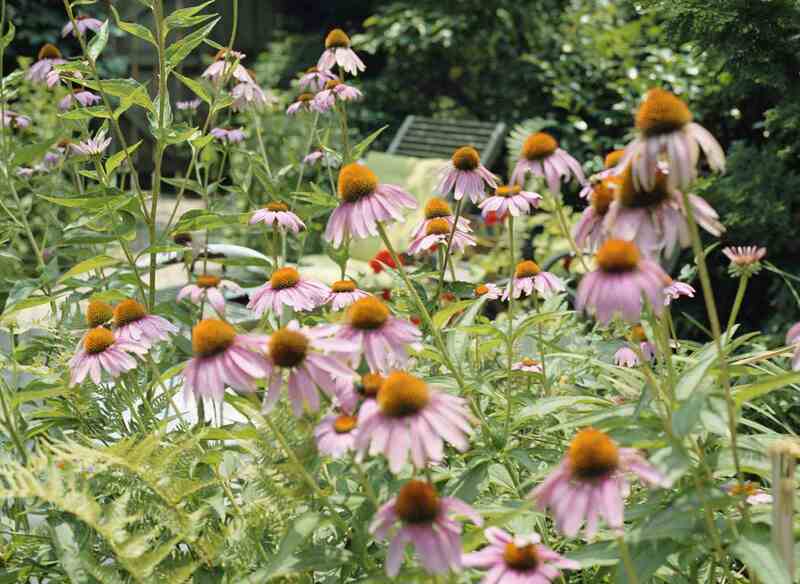 Echinacea, also known as purple coneflower, grows in virtually any garden situation. From moist, fertile soil, to dry, arid conditions, echinacea has a variety for practically all conditions. To help your echinacea spread out in the garden, wait until the cone flowers dry up completely. Then, remove the head and separate all the pointy black seeds that are left behind (gloves are recommended because they are sharp). Spread the seeds anywhere in your garden you hope to have more plants. Sage is a wonderfully versatile herb for your garden. It comes in many colorful varieties and growth habits. Try using it as a lovely filler around other tall garden plants. Sage will grow for many years, returning after even the harshest of winters. The only drawback to growing sage for years is that it can become woody and the leaves will grow only on the end of the stems. Avoid this by keeping it pruned back to encourage new growth. The leaves will grow close to the cuts and result in a more beautiful specimen. Eventually, it is unavoidable that sage will become woody. If you have more than one sage plant, you can replace your woody plant with another one. Lavender is used for everything from cooking to healing. Try growing this elegant herb alongside your best flowers. From shades of purple and blue to white, lavender is truly a wonderful perennial herb. Be sure to plant lavender with growing room. You will be shocked at how large the plants can grow after a few years. If you have had little luck growing lavender, try finding a specimen that is best suited for your garden zone. There are many to choose from and you may not have found the right one yet. Another trick you might try with lavender is to grow it in a whiskey barrel that has been cut in half (or a similar porous container). Then, as the weather grows colder, you can move the barrel into a protected area for the winter. It is the cold and dampness that can kill lavender. Wet roots are the biggest concern, so give your plants plenty of drainage. Thyme is one of the herbs that will grow in any garden. It is perfect for gardeners who are not particularly hands-on because the less you fuss with it, the healthier it becomes. It also has varieties with both upright and trailing habits, so there is one to fit almost any situation and design. Use thyme as a filler between your stones in a walkway. It offers a lovely scent when stepped on and can handle moderate traffic. Thyme grows well in areas that are too dry and poor for many other plants. Thyme loves to be trimmed back. It can easily be trimmed into decorative shapes for a more formal look. If you want to multiply your thyme, simply divide up a healthy plant or take a cutting. Mint is invasive, but it is also an important addition to any hard-to-cultivate garden. It will spread anywhere you allow it and many places you do not want it to. Try to plant your mint in a bucket that is buried. This should do a fair job in containing the plant. Mint is a refreshing, gentle tea herb and a lovely scented plant. Try growing a greater variety of mints if you are really interested in using it for tea. Remember that you do not want your mint varieties to mingle, so allow plenty of room between them. This helps ensure that the bees and butterflies do not cross-pollinate the plants. Some gardeners choose to plant mint beds out of sight of one another which seems to be an effective way to keep them pure. Perennial herbs are a great way to grow your garden landscape with far less effort than replanting every year. You might consider drawing up your garden design and include all of your perennial herb locations. This makes easy work of planning where the annual plants can fill in the empty spaces between the perennials. What Is an Ornamental Herb and Why Would I Cultivate One?